This daguerreotype taken at Mount Holyoke College, December 1846 or early 1847 is the only authenticated portrait of Emily Dickinson later than childhood. The original is held by Amherst College Archives and Special Collections. ↑ "एमिली डिकिंसन की कविताएँ / एमिली डिकिंसन". कविताकोश. अभिगमन तिथि 14 जनवरी 2017. 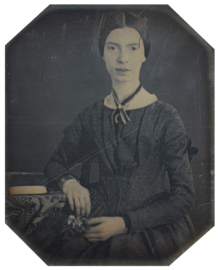 ↑ "Poet Emily Dickinson Was A Much Loved Baker". NPR. अभिगमन तिथि दिसंबर 27, 2016.